Dashama Konah Gordon, is an internationally known Teacher, Author and Lifestyle Coach. Founder of the Global 30 Day Yoga Challenge, Perfect 10 Lifestyle online Community, Yoga for Foster Children and Pranashama Yoga School. After a tumultuous childhood facing many challenges, she has triumphed over adversity. She now uses her own story to empower and inspire others to work through their own obstacles, by using the powerful yogic methods. 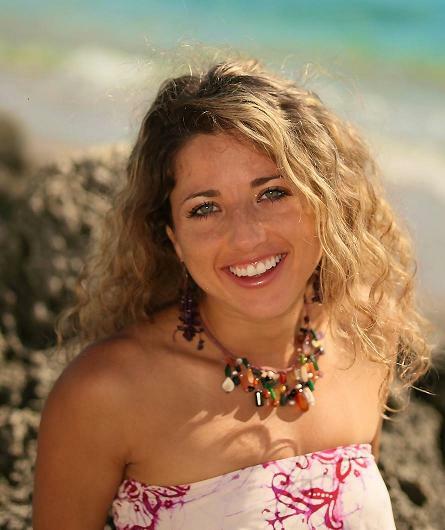 Dashama's lifelong interest in Health and Life Transformation, Conscious Human Evolution and Environmental Awareness have lead to the production of 4 best selling instructional Yoga DVDs and 2 books. Dashama began practicing yoga and holistic health and dietary methods as a child, with her mother and sisters. Throughout her life, Dashama has participated in many sports and activities, from rock climbing, hiking, softball, cheerleading, dancing, snowboarding, kiteboarding, diving, swimming, volleyball and cross country long distance running, in addition to many forms of martial arts and yoga. 10 % of all proceeds go to Dashama 's not-for-profit organization "Yoga For Foster Children." 1. Hi Dashama! What a pleasure to have you speak with us today. Please take this time to introduce yourself, your mission in this world, your passions and yoga workshops that you offer. My name is Dashama Konah Gordon. I am a holistic health ambassador, yoga teacher, author, model, performer, creator... its hard to put a label on what I do... although everything that I do is for a common intention: to create awareness, to illuminate the world - to inspire people to live their healthiest life now and to strive toward their highest potential in all ways: mind, body, spirit and emotionally. And to do this at the service of others. I am passionate about life in all of its wonder and magic. I teach workshops, retreats and trainings around the world to guide people on an adventure, exploration both into the inner and external dimensions of existence in an easy to digest accessible way that anyone without any prior experience will benefit. Yoga is my most popular offering, and I also teach a holistic lifestyle approach to living yoga - integrating my 3 Stage Energy Diet, meditation, yoga, fitness, and goal setting techniques to help people get on track and stay committed to their highest level of excellence. I love to see people succeed. That is what drives me. To see the transformation people experience from beginning to end of a program, workshop or retreat. 2. We know that you travel a lot and have visited some truly amazing and beautiful places. 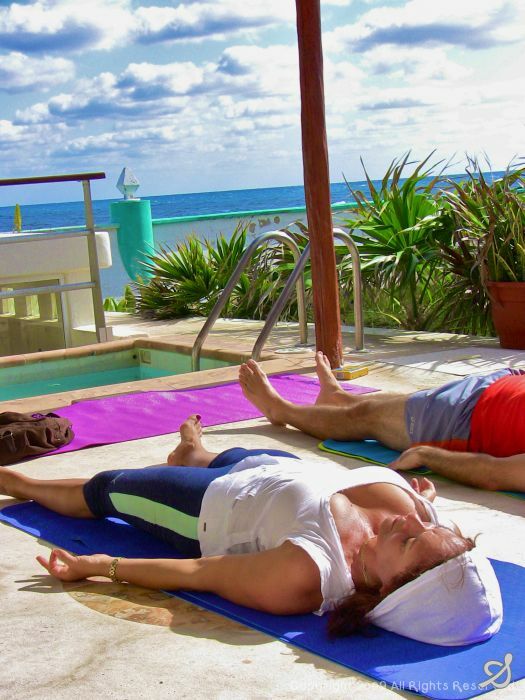 Your latest adventure that you just came back from took place on Isla Mujeres in Mexico. Tell us about your experiences and perhaps upcoming retreats that may interest our readers. I love to travel. It is an essential aspect of everyone's awakening journey. I visited the Mayan ruins when I was 7 years old, traveling throughout central America with my mother and sisters. This really instilled a depth of compassion for those less fortunate then me at an early age. We lived amongst the poorest people in Mexico and Belize for 4 months. I witnessed death, disease, starvation, and everything in between. I learned to be brave and trust I will be protected. Since then, I have visited some of the most sacred sites in the world- India, Israel, Jordan, many countries in Europe, Costa Rica, Canada, every state in the USA. I am organizing a retreat to Bali every year including this year. That will be amazing. I am teaching at the Whistler Yoga Conference in Canada in June 4-6. A full immersion. Also I'll be fire dancing at Bhakti Fest in Joshua Tree, CA in September. Stay tuned for that too. It will blow you away, really sweet concept that will change the way people look at yoga forever. 3. Aside from traveling you are also a creator of a 30 day yoga challenge. Please tell us more about this program: who can benefit from it and how? I created the 30DYC (that's what I'm calling it now) for people so they can really experience the benefits of yoga. It's impossible to do yoga once or twice a month and really know what it can do for you. A full immersion is really the key to transformation through the practice. Taking the practice off the mat and into your daily life, you can start to see that everything is yoga. Yoga translates to mean 'Union' so you can begin to see how we are all united, we are all one. With this understanding, we can become a little more compassionate about each other and toward even those whom we dislike. This can raise humanity into a state of peace hopefully. Also the 3 Stage Energy Diet included in the 30DYC program encourages people to eliminate junk food, toxic processed foods that are robbing them of their natural vitality. The second stage is a vegetarian diet, incorporating more superfoods and really cleaning up the diet. The third stage is gearing more toward an 80/20 raw diet (just for a week to try it out) and then the 4th week is an optional detox cleanse for all of the organs including Candida Cleanse, Heavy Metals cleanse, parasite cleanse, organ and colon detox/cleanse. This is all optional, but will definitely raise the vibration of the practitioner. And The other components of the 30DYC include my book, "Journey to Joyful" and the "Daily Health Journal" to keep track of daily meals, exercise, meditation, gratitude, etc. People all around the world have been experiencing transformational results following this program since 2008 and now it is being launched on a more massive scale, partnering with National Yoga Month and other similar organizations to spread the love to a wider market. 4. You have inspired so many people to transform their minds and bodies to a more evolved state. But can you tell us how did it all begin? Who was your inspiration and made you a person that you are today? At what point did you decide that you wanted to teach? My mother was my first yoga teacher. That was very powerful for me. She taught holistic health, meditation, non attachment and many of the principles that I speak about in my book, "Journey to Joyful". I practiced yoga for the duration of my life, by myself. It was what kept me sane throughout a very tumultuous childhood. My inspiration to teach yoga came from inside. I didn't have any teacher that really triggered that for me. It was a heartbreaking breakup with a boyfriend that drove me to find a yoga studio and immerse myself in the training. That was in 2005. In a short time I knew it was exactly what I had been longing for and I had found my dharma, my true calling in life. To serve humanity through the transformational power of this ancient scientific system. Luckily, I was already a personal fitness trainer, so incorporating the yoga techniques into my training with clients came naturally and I slowly gravitated away from the fitness trainings I had been using, due to my desire to teach the more subtle and more spiritual practices that were only available through yoga and not through any other modality I had been trained in prior to that. 5. Dashama, you have recently given an interview on raw foodism. As it becomes so popular in a modern diet, what are your recommendation for those who just start switching to a healthy diet? Is raw foodism suitable for everyone? How about children? Raw foodism is essential, to integrate into anyone's diet. I don't necessarily recommend for people to eat 100% raw food though. It is ok for a while, perhaps a few weeks or even up to 6 months. Then it is most preferable to incorporate a balanced diet. I prefer about 70/30 raw to cooked food with an emphasis on organic foods, not over cooking when I do cook, and eating genuinely wholesome foods. Eliminating all processed foods, breads, sugars, starches, etc. This is all detailed in the 3 Stage Energy Diet in the 30DYC. After someone tries all 3 stages and then goes through the 4th stage of detox, then I recommend they either find where they feel resonates best with them or just keep circulating back through to the beginning and start over. This is a really clean and clear way to eat, and will ensure weight loss, weight balance, longevity and total vitality. Children can eat raw food, but i do suggest they stay in the 60/40 range or so. And it is essential to consume plenty of water, good fats, B vitamins and probiotics for optimum digestion. 6. Many people in the Western world still equate yoga solely with movement, and do not consider the spiritual aspect. Could you explain us what are the true benefits of yoga? Yoga is so much more then just physical movement. Yoga means "Union" to unify with the Supreme Source. This is the essence of the practice. Whether one is on the yoga mat, breathing, stretching, sweating, or flowing with grace- or off the mat: dealing with co-workers, family, life situations- yoga can help with all of this. It is a state of mind that we can carry with us throughout all situations and in every moment. When we can step outside of our situation and simply observe ourselves as a silent witness watching a screenplay, we are able to be more objective and respond, rather then react. Act from compassion and empathy, rather then ego or selfishness. This is the true yoga. And everyone in the world can benefit from that. 7. My website focuses on healthy diet and weight loss. In your opinion is yoga good for weight lose and/or muscle toning? If so which type of yoga will benefit the most in terms of losing weight? And is yoga asanas enough for an exercise or should it be combined with other forms of physical activity? Yoga asana practice, also called "Hatha Yoga". Integration of the sun and the moon - uniting both masculine and feminine aspects of ourselves. I love vinyasa yoga. My style I teach is called Pranashama Yoga. It incorporates various styles of yoga (asthanga, power, anuasara and vinyasa) with martial arts and dance - with the occasional sequence/workshop including some Thai yoga healing arts and qi gong internal energy work. When people ask me if it is enough to just practice yoga, I say, it depends. Yes, if you are practicing Pranashama Yoga - it will be more then enough. It is a vigorous style and will tone the muscles and strengthen your body while opening it up in a balanced way. We move with the breath and honor the rhythm of our hearts while we connect with the inner self/ Spirit. Thus, by the end of the practice, we are completely open, receptive to the messages that may appear for us during our meditation and we will go deeper into our inner realms. That is the magic of yoga- to move the body in such a way that when it finally comes to rest, this inner realm of the mind is so still and expanded, we have profound realizations and intuition about life in these moments. 8. What about meditation? Is it a necessary part of yoga practice? How does it benefit oneself? As I mentioned above, yes, meditation is essential. My approach to mediation is all encompassing. I feel there are so many ways to meditate. Beyond the traditional sitting silently, there are others that may resonate with people more, depending upon their natural composition. For people who are highly aggitated (kinestetic), perhaps trance dance movement meditation would be best. For those who are more inclined to stillness, seated meditation may be better. For people who can easily become absorbed in silence when listening to a guided meditation, yoga nidra will do wonders. I teach all of these, as they offer a profound variety of avenues to achieve the same expanded state of awareness that we all seek. It can calm you, bring your life into perspective, open you to your deeper intuition and expanded level of potential. Meditation is scientifically confirmed by medical and other professional institutions for enhancing all aspects of live, it is anti-aging, and can only benefit the practitioner in all areas. No negative side effects have been reported, that I am aware of. 9. Those who follow you on youtube channel could not miss your truly amazing Dashama yoga fire dances. Please tell us more about them: is this art a type of yoga or was it your idea to incorporate yoga in the traditional fire dancing? It is mesmerizing and invigorating. Enlivening and beautiful. The traditional techniques are great, but my body begs me to MOVE in a way that is in rhythm with the music, with my heart beat and with my energy as it flows. Thus, yoga fire dancing was born. I incorporate rhythmic movement, traditional fire dancing techniques and some modern dance. It is much more then just a dance however. It is a way one can break through barriers and fears in their life. It is also a powerful practice to balance the brain hemispheres, develop coordination, ami-dexterity and agility practice, all of which begin to diminish as one grows older. So I plan to create an instructional dvd, for people to practice (no with fire:) and develop these skills as well. 10. Dashama, thank you so much for your insightful answers. As our last question, what is exciting you the most in your work right now and in the vision of your teaching in the future? Right now, what is exciting me most? I am eager to begin production of the "Battle of the Trainers". I know that will be a powerful 10 weeks of total transformation for my group and for the viewers, as they will be able to follow along on the journey and practice along at home with my DVD, book, diet and the journal. I'm also really excited about creating my summer and fall schedule- which will include Europe and Asia amongst other adventures. I'm also really looking forward to working with some of the most acclaimed photographers and video-ographers in the industry to create some inspiring videos and print images for the next line of instructional DVDs and books coming out later this year. Busiest time! I'm excited about moving forward with my non profit organization "Yoga for Foster Children and Orphans" bringing hope and love to the destitute children who are living without parental love and support. Also, partnering with National Yoga Month will be great, and the new line of logo wear will include full yoga outfits, as well as a calendar, another book is already in the works and more fun stuff... So stay tuned. 2010 is definitely going to be a powerful year for us all. And for anyone reading this, who may be feeling the weight of the world, the economy and or any other circumstances in your life: I highly recommend you read my book, "Journey to Joyful" and follow along with the exercises in there. It will bring you to a whole new level of clarity and purpose in your life. The more people in alignment with their highest potential- the more rapidly we can transform this planet, heal it where it needs to be healed and live the lives we are destined to live: free, loving, joyful and prosperous. May all your dreams manifest.